Viv and Dave got married. Now they're in Europe. This is what they're up to. On our second day at the Cretaiole, we set out for a day trip to Siena, a nearby city (as compared to the tiny towns if Tuscany) to Pienza. Siena is home to the oldest bank in Europe and is rich in history and culture. 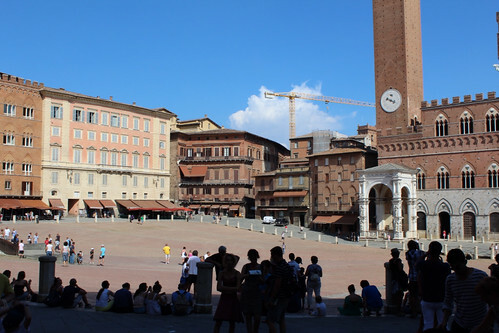 What continues to amaze us is that cities in Italy that we would consider small (Siena has a population of around 25,000) are divided into smaller districts and Siena is no different. There are a number of districts in Siena, and one's district used to be determined by birthplace. When people started delivering their babies in hospitals, they chose the district that they wanted their child to belong to. 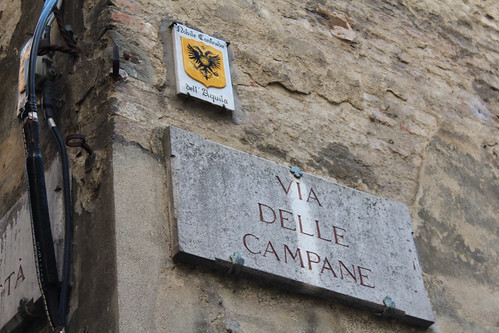 The city streets are distinctively marked with flags that indicate what district of Siena you are in, each district being represented by a different animal. In ancient times, the districts of Siena would battle each other in Medieval games, often to the death (Hunger Games, anyone?). This tradition soon evolved into the competition of choice that still exists today, the Palio. In a nutshell, the Palio is a horserace in Siena's main square where 10 out of hundreds of horses from the different districts are chosen to race twice a year, once in July and once in August. Businesses shut for the day so that everyone can attend the Palio. The districts pay jockeys up to $500,000 to ride their horse (and the rules state the winner is the first horse to cross the finish, with or without the jockey!). To stand in the square and picture 25,000 people packed in it in the Italy summer heat all day to watch a perilous race around the outside of the square was quite incredible. People pack the inside, race goes around the outside! 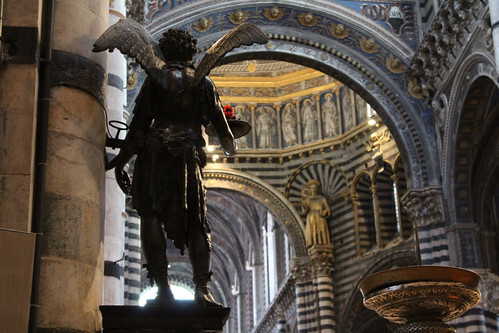 Our guided tour ended with a visit to Siena's Duomo, which was quite breathtaking. Incidentally, the winning horse of the Palio has such high status in Siena that its jockey rides right into the Duomo and up to the altar during mass. 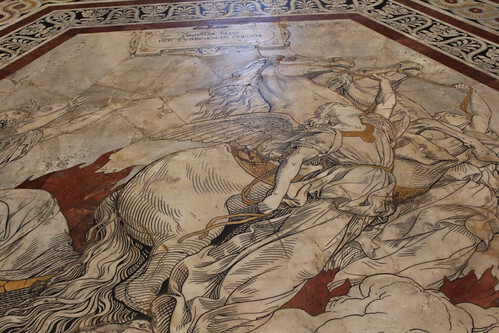 We were fortunate to visit while the floors were uncovered, as normally the Duomo is a working church and they cover the beautiful floors for most of the year to protect them from wear. It was also nice to have a guide to explain the significance of all of the works inside, rather than just passing through and not having any idea what we were looking at. 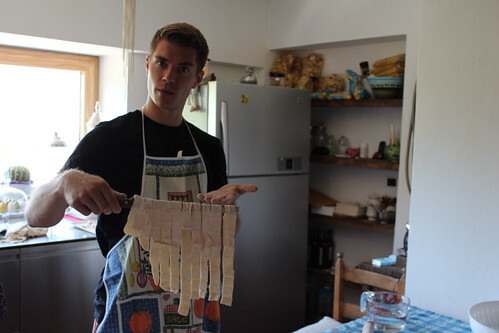 Following a day and a half of wine tasting, we embarked on another activity that we were keen to while in Tuscany - cooking! Our first class was put on by Isabella, our gracious host at Cretaiole. 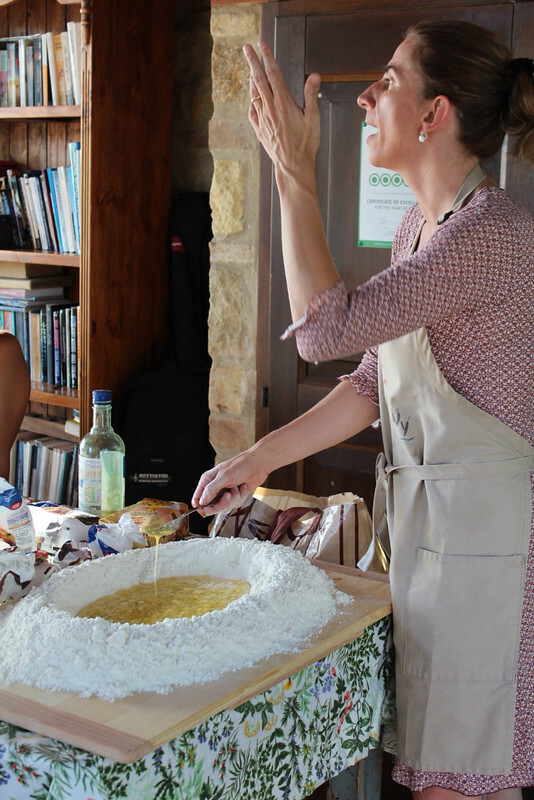 She taught us how to make pici, the typical Tuscan pasta which looks like thick spaghetti. We watched in amazement as she made a huge crater of flour in the middle of the table and proceeded to pour eggs and water into it, mixing together the dough without having a drop of the liquid spill out of the crater (although apparently that takes some practice, as she had a waterfall of gooey mess spill all over the place one of the first times her mother-in-law was teaching her to make it). We then all took turns kneading the dough and then rolling it out into pici, which was then cooked and served with Isabella's homemade ragu. Her husband, Carlo, grilled up sausages made that day by the local butcher, and ribs that were so tasty (clearly our trip has necessitated more "flex" in our flexitarian diet), and we dined al fresca in the backyard of the agriturismo. 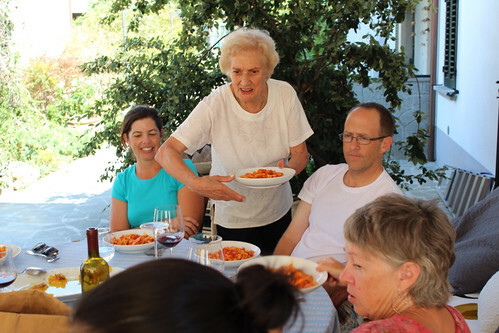 Isabella shared stories of the family and the way they live their rural lives in Tuscany, while her father-in-law Luciano, the patriarch of the household, bustled around adding food to people's plates and pouring his famous homemade grappa. It was a truly memorable night for us. The next day we attended another cooking class, this time hosted by the owner of a restaurant in the nearby tiny town of Rocco d'Orcia. Normally, they do the class in the kitchen of the restaurant, but we had such a large group, they had to move it to the kitchen of her mother's house. 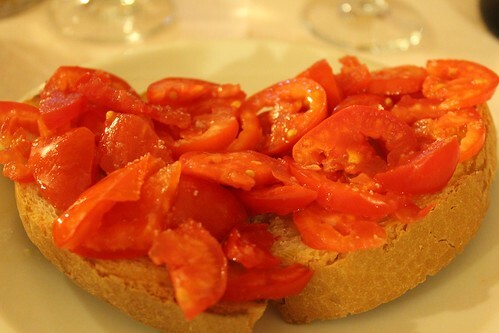 Cooking in the actual kitchen of an Italian mamma was an experience all in itself. The wonder of Tuscan cooking is that the dishes use all of the foods that they have at their disposal, letting nothing go to waste. Day old bread is used for soups, to thicken a pasta sauce or stuff peppers. No more throwing out hard baguettes when we get home! We sat down and ate the dishes we made, and I made Dave take a picture of the owner's nonna (grandmother) who brought us our pasta. She was adorable! While in the garden this morning, I met Luciano, who is the patriarch of the family and a fixture of the agriturismo. He is about 70 years old, speaks no english, and insisted that I join him for grappa and vinsanto later in the evening. He also loaded me down with fresh lettuce, tomatoes, and basil to make insalata, then wished me a friendly ciao. Our first activity of the day was a tour of a nearby organic farm. 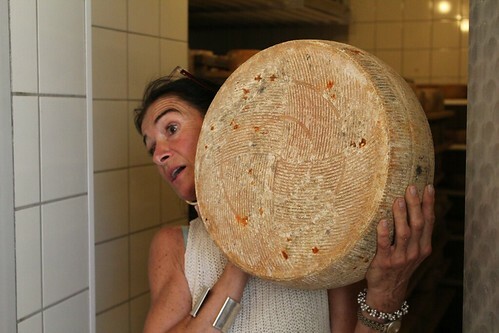 The farm is a government subsidized venture engaged in a more traditional way of producing grains and dairy products. According to Sandra, the owner, the government is alarmed by a recent trend of obesity in Italian youth and attributes this phenomenon to increased gluten consumption as well as synthetic food products. 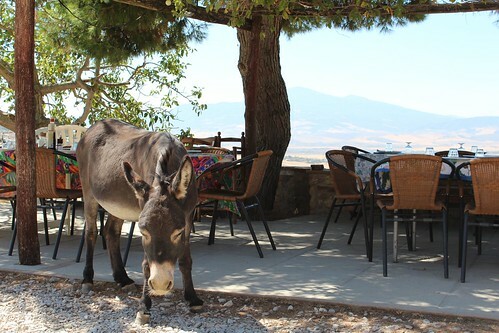 Sandra and her pet donkey gave us a comprehensive tour of the facilities, then treated us to an organic lunch. She did not sing "coombaya" or chant "ohm" during any part of our visit; she is simply a staunch believer in a more natural way of living and eating, and offered some very refreshing insights on modern nutrition. After overcoming the shock of learning that Vancouverites don't have a monopoly on vegetarian, Gluten free, organic eating, I was immediately taken with Sandra's fundamentalist nutritional philosophy. None of the livestock are fed any antibiotics or steroids, and pesticides are not used in any of the crops. In keeping with the gluten-free ideal, the farm grows Farro, an ancient grain, as opposed to the genetically modified wheat common in industrial operations. 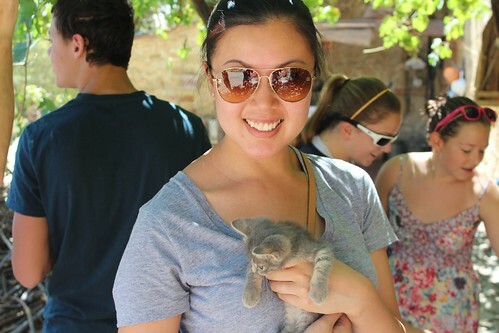 Did I mention that the farm featured kittens? After visiting the farm, we returned to Cretaiole for some downtime. This was enforced relaxation time because of the extreme heat in the afternoon hours. Temperatures border on 40 degrees celcius and our host Isabella told us that this was the hottest August in over a decade. 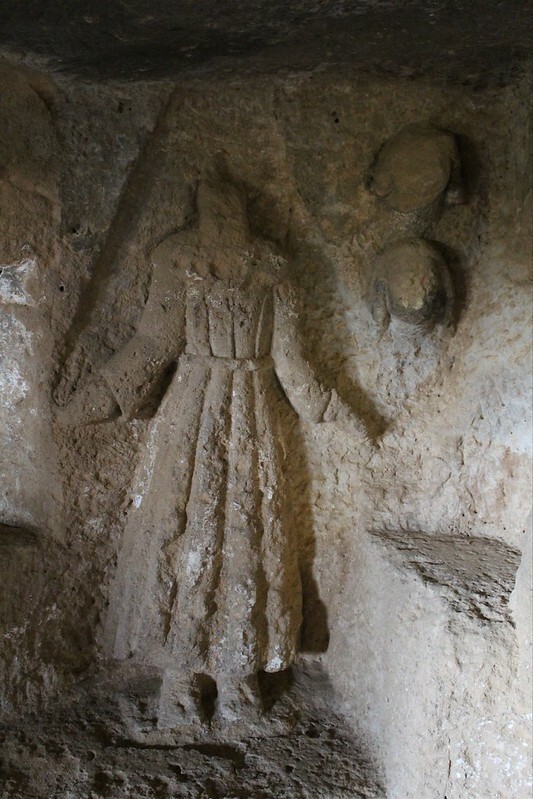 After our relaxation time, we joined a tour of one of our host family's properties, which is an ancient ruin site believed to have been a burial ground for Etruscans, then later repurposed as a hermitage by medieval monks. The site was a bit spooky but fascinating from an anthropological perspective. One culture's burial ground can be another's place of worship! We ended the day in Pienza at the lovely "Latte de Luna" restaurant, where I had the greatest gnocchi ever and Viv enjoyed a fantastic eggplant parmesan. My bruschetta appetizer. I finished the gnocchi before Viv could get the camera out. Well, we thought we ended the day that way. At about 10:30, there was a loud banging on our door. Sure enough, there was Luciano, a bottle of grappa in one hand and a bottle of vinsanto in the other, inviting us over to the common room to drink with him (I think that's what he was saying). He rounded up some other people from the agriturismo, got the music going, and danced with all the ladies while the men drank his home made concoctions. Grappa is a spirit distilled from grape skins which have been cast off after the wine making process. It is clear in colour, 40% alcohol, and definitely an acquired taste. Vinsanto is a sweet red wine that tastes like ice wine. Both are drunk out of shot glasses. We finally retired, for the second time, at 12:45 on the promise that we would drink with Luciano again tomorrow. 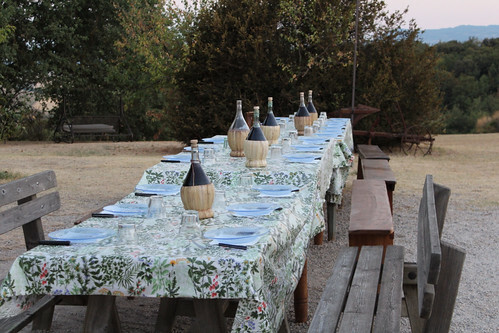 Just a quick note to say that we reached our Tuscan agriturismo, just outside of Pienza. There are many of these agriturismos along the winding roads, farmhouses converted into bed and breakfasts for travelers wanting to visit the surrounding towns for wine and olive oil tasting. It is picturesque here, and extremely peaceful. A nice change from city life. But along with leaving the city, we have also left a constant wifi connection. The wifi connection is located in the common room of the agriturismo and is as slow as we have been moving in the heat, so we may get more behind on blogging than we already are. Trust us when we say we are having the time of our lives and will document our adventures soon!